This section is primarily for news items that Clubs might previously have submitted to the District Magazine, which has now been replaced by the email Newsletter. 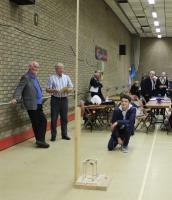 The Newsletter is focussed on future events, so past events are more appropriately placed on the website. Some Newsletters, e.g. RIBI Communications newsletters, can be found in the Members Only Section. This can be accessed by logging in through Club or District websites, even if your Club does not use the RIBI template, provided you are registered on the RIBI system. Susie Morgan, Ripon Young Musician of the Year, proudly displays her certificate as a heat winner at the recent Rotary Young Musicians' Tournament. She takes her place in the final in Edinburgh next month. On a bleak morning in late January 2018 12 Rotarians, their partners and friends joined Roger Parkinson from the Woodland Trust to plant 150 native species trees at Shawcross. Hornsea and East Riding Rotary Club had the Archbishop of York, the Most Reverend and Right Honourable Dr John Sentamu as the guest speaker at a recent meeting. At a recent weekly meeting of the Rotary Club of Halifax, past DG Ken Robertshaw was presented with RI’s highest honour, the Service Above Self Award. 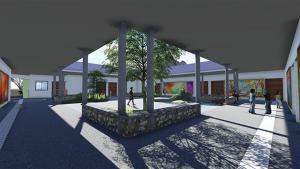 Headingley Rotary Club, assisted by several other clubs in District 1040, organised the raising of £8,000 in order to attract a global grant from Rotary International of $35,000 for Sylvia Wright's new Therapy Centre. At the Leisure Centre in Halifax schools from within Calderdale had a great day challenging one another to launch a missile into ‘the atmosphere’ and then safely return the rocket’s capsule back to terra firma! 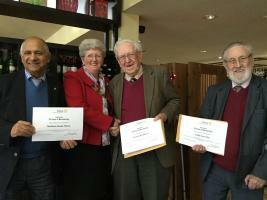 Six Rotarians were awarded 25 year service certificates for their dedication in providing 25 years service at Hornsea and East Riding Rotary Club recently. At a recent weekly meeting of The Rotary Club of Halifax, our local MP Holly Lynch was welcomed as an Honorary Member into its club. The Rotary Club of Hornsea and East Riding sponsored ‘Morpheus’, a Formula 24 car entered by Hornsea School in a Le Mans style competition organised by Greenpower Education Trust, a charity promoting sustainable engineering to young people. The first charity Ripon Rotary Bike Ride after taking over from Acorn was well supported on May 13th with over 600 riders. 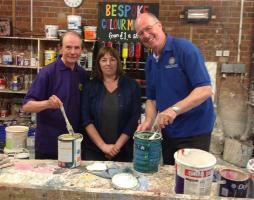 Dememtia Forward, Scleroderma Resaerch and Ripon Rotary charities will benefit. 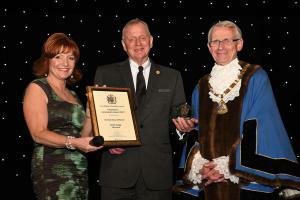 Rotarian Keith Twigg PHF of the Hornsea and East Riding Club has been awarded the East Riding of Yorkshire Chairman’s Community Individual Award at an awards ceremony in Bridlington. 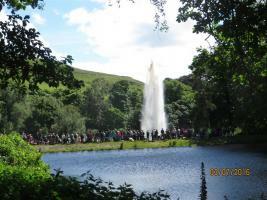 On Sunday 2nd July people flocked to the estate of Castle Carr to see its famous pressure fed fountain rise majestically well over 120 foot into the air. Former Rotary Scholar Daniel Smith and his wife Yasmin paid a short return visit to Leeds at the end of June, staying with Margaret and David Kirby. The Rotary Club of Halifax held their fourth annual Primary School Quiz Heat at Ravenscliffe High School and Sports College on 16th March 2017. Residents in local care homes were recently taken on a tour of the daffodil sites in the area by some Club members. Over 60 Rotarians and guests filled the dining room at the Wrygarth Inn for the Hornsea and East Riding Club’s 60’s night. 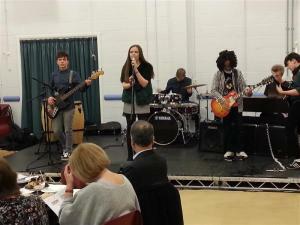 The aim of this Scheme is to help some of Hull"™s talented young musicians flourish by developing their potential. The kerb is opposite the Ripon Spa Hotel where the Rotary Club of Ripon hold their meetings. On Thursday 1st September at West End Golf Club, the Rotary Club of Halifax held its 20th Charity Golf Day. On Sunday 3rd July on the estate of Castle Carr in Halifax, its famous gravity fed fountain rose magnificently into the blue skies in aid of Rotary local charities. 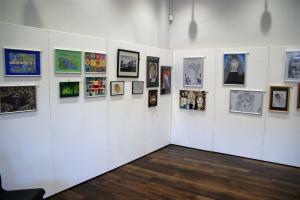 During August 2016 RC Holderness members are staging an exhibition of artwork at Hull Central Library, showcasing the artistic talent of students in Hull's schools and colleges. 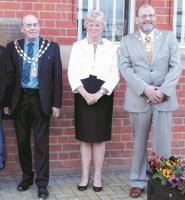 Ripon Rotary members have recently finished re-planting the Ripon Horn on Rotary Way. 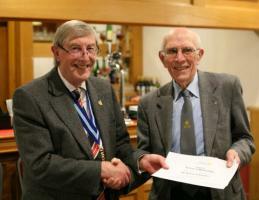 Hazel Haas handed over the District Governor's chain to Phil Poole. 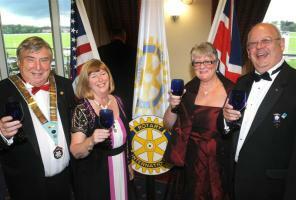 The Rotary Club of Leeds has just celebrated its 100th Birthday. The Rotary Club of Normanton held another successful, Young Citizen Award event at the White Horse in Sharlston on Wednesday 27th. January 2016. 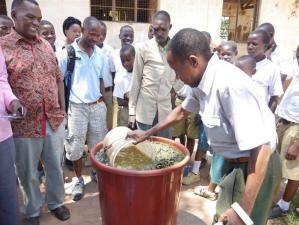 A low cost sustainable farming project has transformed a school with 1065 pupils and the surrounding community. The Rotary Club of Halifax at its recent dinner celebrating its 94th Annual Charter, was proud to present to Rotarian Ken Robertshaw one of Rotary International"™s top recognitions, passing to him an "˜RI Avenues of Service Citation"™. Details have arrived of the first two nurses to undergo training sponsored by Pontefract Rotary Club via the Darjeeling Children"™s Trust. This includes the cost of accommodation and food along with uniforms and books. The crack Rotary Club of Ripon Pancake Race team made an impact yesterday at the 18th annual race staged by Ripon Festivals in conjunction with Ripon Rowels Rotary Club. 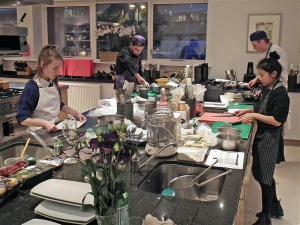 The invitation to this event promised "˜an evening of music and mouth-watering treats"™, which was a bit of an understatement: those Rotarians able to get to Roundhay School last Tuesday evening were rewarded with a feast, both gastronomic and musical. 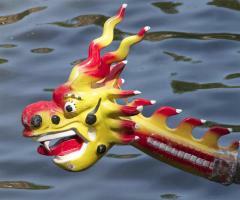 The Rotary Club of York has been awarded an International Significant Achievement award for organising the annual dragon boat challenge. Kilts were in abundance among the ninety people who celebrated the life and achievements of Robert Burns at the Spa Hotel, Ripon. In the Queen"™s Birthday Honours List, Rotarian, Derek Searby TD, Normanton Rotary's "President-Elect" was awarded a CBE (Commander of the Order of the British Empire). For more than ten years the Rotary Club of Normanton has launched an appeal for the collection of decorated shoeboxes containing gifts for children of all ages, in the period just before Christmas. 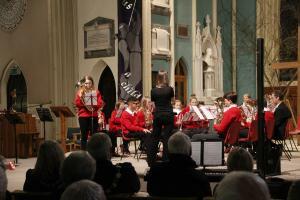 The Rotary Club of Ripon sponsored a Celebration of Youth Through Music Concert at Holy Trinity Church in aid of Dementia Forward. The Rotary Club of Otley Chevin after the bad weather managed to finish off planting Daffodill bulbs along Rotary Way. The Rotary Club of Sowerby Bridge held its Tree of Lights switch-on ceremony last Friday and it was attended by over 50 people. The funds raised this year will contribute towards the Club's external Defibrillator Programme in the Sowerby Bridge area. 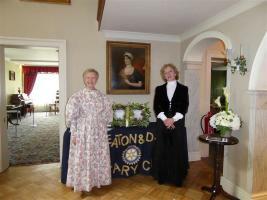 Glasgow born Wendy Richardson is Ripon Rotary's first woman associate member and was welcomed into the Club at a recent meeting. 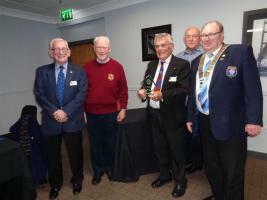 The Rotary club of Leeds have been holding a Blood Pressure day for several years always in late October, and in this, their Centenary Year, took more BPs than ever before. A pupil at Cragg Vale J & I School has won first prize in the Rotary Young writers Competition! Pontefract Rotary is organising an Indian Meal on 21st July 2015 at the Thaal Restaurant, Great North Road, Brotherton WF11 9EE (formerly "The Brotherton Fox") to raise funds for the Darjeeling Children"™s Trust (DCT). Ruth Perrott, an optometrist, joined the Rotary team visiting Ukerewe in Tanzania to run eye clinics and provide spectacles. 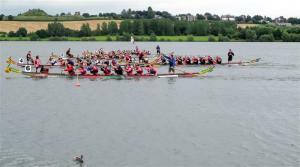 Rotarians and guests gathered at Sandal Farm Bradford to celebrate the finale of the Rotary River Aire Challenge. 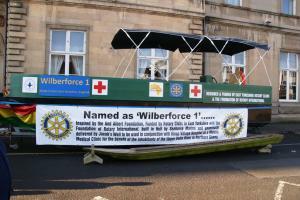 Many Rotary clubs involved themselves in various ways when Le Tour de France visited Yorkshire. A Bradford man will try to canoe the length of the River Aire and drink its water along the way to keep him going. The Skipton Clubs organised their second Young Citizens Awards, it involves around 18 months planning of promoting and collecting sponsors, 3 days of judging the entrants in 5 categories Art, Music, Sport, Work Place and Citizen. 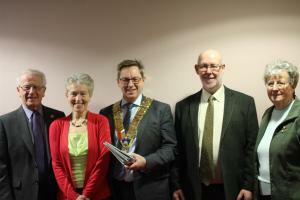 The President of Rotary International in Britain and Ireland, Nan McReady, visited Yorkshire (Rotary District 1040) in November. The 2013 York Rotary Dragon Boat crossed the finishing line at an awards presentation hosted by the Sherriff of York in the Mansion House. Rotary’s 3rd Navigation Walk was organised by 9 Rotary Clubs with another 7 assisting, to raise funds by sponsorship for Overgate, Forget Me Not, Wakefield, Kirkwood Hospices. 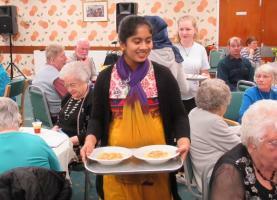 Contact the Elderly is a charity set up to provide monthly tea parties for elderly people who are lonely or otherwise unable to get to social events. On January 20th the York Rotaract Club put on a special "Egyptian Dinner" organised by Rotaractor Jenny Michel, who is from Egypt. Apart from many members being out and about playing the part of festive postmen in the Wakefield club’s first Christmas card charity mailing project, there was plenty to do in the lead up to Christmas. 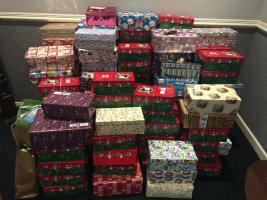 Working together clubs can achieve more, the Rotary Clubs in Calderdale believe, with a figure approaching 4,000, the distribution this next week of Christmas shoeboxes will bring happy smiles to a great number of Calderdale folk. Halifax Rotary Club’s immediate past President David Horsman made a presentation of a cheque to Lt Col Zac Stennings on the occasion of the 3rd Battalion Yorkshire Regiment’s recent visit to Halifax. Rotary Club of York President Darrell Hind presents a cheque for £300 to Major Andrew Dunkinson, Commanding Officer of York Salvation Army. 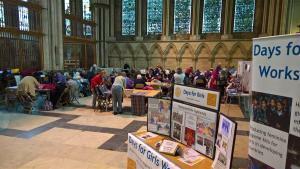 A compilation of photos taken at the 2012 Conference in Scarborough. Thanks to Mike Wilkins and Brian Souter. Two major UK Removal and Storage Companies have agreed to carry Rotary ‘End Polio Now’ Logo’s on all their vehicles. GB Liners and White and Company will carry the logos on all their vehicles used for both National and International removals. 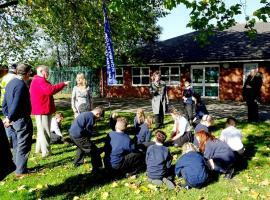 I will add photos of the District handover as I receive them.So please send some!This one was sent by Colin Perrott, courtesy of York Press. Ken Robertshaw, of the Rotary Club of Halifax, has accepted the Challenge of a Lifetime to help the Theodora Children’s Trust put smiles back on the faces of children who have to spend time in hospital. Members of the Rotary Club of Sowerby Bridge watched the Huddersfield Town match against Brentford from the Yorkshire Air Ambulance hospitality box at the Galpharm Stadium last Saturday. At District 1040 Council meeting in Fulford School on 1st October D G Willie Clark presented John & Mike Russell with inscribed tankards to acknowledge their eight years service as District Shop organisers. This year's District Handover from DG Roger Percival to DG for 2011-12, Willie Clarke took place at York Railway Museum.An excellent evening was enjoyed by everyone in superb surroundings. Recently at The Rock Inn in Halifax, the Rotary Club of Halifax was delighted to present to Colonel Tom Vallings of the3rd Battalion of The Yorkshire Regiment, The Duke of Wellingtons, the distinguished award of a Paul Harris Fellowship. 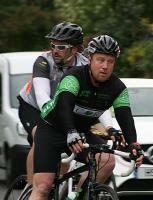 7 Rotarians will ride one trandem and two tandems 216 miles to Scarborough for their District Conference for charites. 2 Protection Workshops for CLUB PROTECTION OFFICERS are planned to explain about the new legislation and procedures. Last night following a ‘fish & chips’ supper at President Ben Griffith's house (their usual venue being snowed in), the Rotary Club of Haworth & Worth Valley inducted two members both aged 30 years, yes 30 years old. 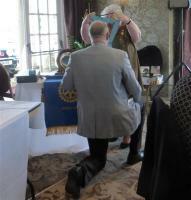 A group fellowship exchange is being arranged between District 1040 and District 5330 in Southern California.